Approximately once a month, I teach an Introduction to Fermentation workshops. 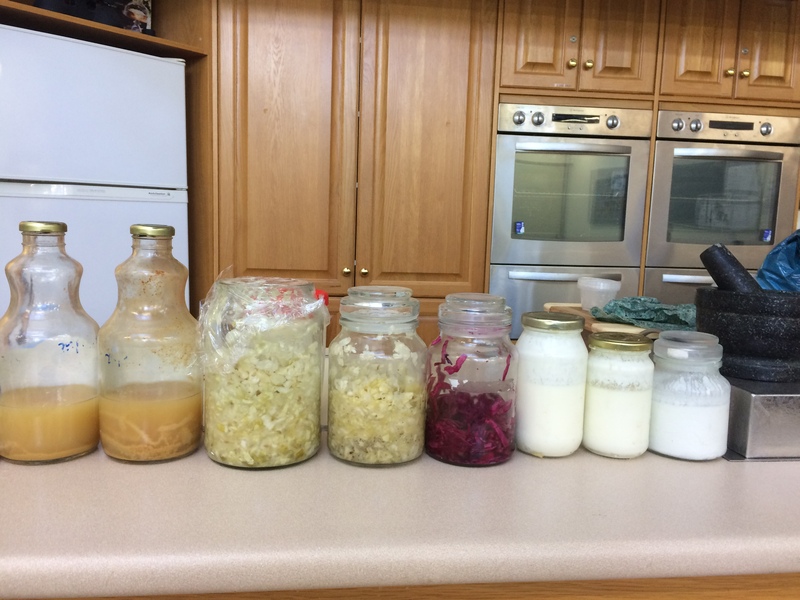 These workshops are hands-on, and participants get their hands into making fermented foods. Often, participants say they have tried one or two ferments at home, and they are either not sure if it tastes “right” or not, or worse, something has gone wrong and they don’t know why. And when you aren’t quite sure what is happening, you are hesitant to put that in your mouth (these are live cultures, after all!) or you are afraid to try again after tossing out the time, energy and ingredients you have invested. Here is my TOP REASON why ferments fail. Yes, there is only one main reason. I have read through many fermentation instructions online and in books, and one thing the authors tend to skip over is hygiene. Have you washed your hands and all equipment in warm soapy water, and RINSED OFF the soap residue? Have you sanitised all the equipment and bench-tops? You can buy sanitising sprays that contain benzalkonium chloride, spray the equipment, rinse off, then pour over hot boiling water (this is when you want heat-proof glass). You can also use sanitising sprays or detergents available from brewing shops. You can soak your equipment in a 0.5% chlorine solution. You can wash and rinse off your equipment, then place them in a cool oven, then heat to 120 deg C for 20-30 minutes. You can bring them to the boil in a big pot of water on the stove. If I have run out of spoons that have been sanitised and I need another clean spoon, I have even used aerosol alcohol sprays (the kind that is used to clean electronic equipment) to sanitise the spoon, then leave to air-dry or wipe off with a kitchen paper towel. Have you cleaned and sanitise any lids you are using? If you are using lids for jars that contain a rubber seal, have you removed the rubber seal and cleaned both parts? Why do we need to maintain hygiene? When we make fermented foods, we do not use heat to cook any of the foods, so there is both “good” bacteria and “bad” bacteria present. By maintaining a clean environment, we then give our cultures the best chance to grow good bacteria instead of bad bacteria, bad yeasts or mold. If I ever rush the sanitising step, I get contamination in my ferments. When I teach Fermentation Workshops, it is usually in a community kitchen. This is where hygiene is even more crucial, because community centres are known to carry MRSA (Methycillin-Resistant Staph. aureus). In my point of view (and experience), a little bit of prevention is better than cure. 0.5% chlorine solution or 0.095% benzalkonium chloride is better than 6 weeks of IV antibiotics and 3 months of oral antibiotics. What do you use to cover your ferments while they are fermenting? Most literature recommend clean muslin cloth or Chux-type cloths. I find these are trickier for maintaining a sterile environment, because the weaves of the material is not fine enough. And if you bump the jar too hard and your kombucha wets the cloth, you now have a wet surface exposed to air-borne bacteria. You can use a lid, but you need to remember to “burp” your ferments, otherwise you risk projectile-lids or exploding jars. Plus you will be touching those lids every single day – have you remembered to wash your hands in warm-soapy water each time? You can buy special jars that have “air-locks” to allow gaseous release, or special “crocks” to make sauerkraut, but what if you decide you don’t like fermenting foods, or sauerkraut? You now have equipment you spent money to buy, that is taking up space in your pantry. My solution is cling wrap – sterile, seals well but not completely so gasses are released (no burping needed), you can look through the top of the jar at the surface of your ferments to make sure no bad yeasts are growing, it is water-tight, and you can use recycled food jars for your ferments and not have to worry about suitable lids that are not rusting, or have moldy rubber seals. You can also use it for most ferments. What do I use to weigh my ferments down to keep them submerged in the fermenting liquid? Vegetables exposed to air will “catch” aerobic bacteria or yeasts, which we do not want. Lacto-fermenting vegetables rely on anaerobic Lactobacteria spp. for the fermentation process. So most instructions will state to use a clean dish, a ziploc bag filled with saline/brine or specially purchased weights to help submerge the vegetables in the fermenting liquid. I use a piece of baking paper, folded or scrunched up and pushed down into the liquid. The paper getting covered with fermenting liquid is fine, and it is fine if that is exposed to air. It keeps the vegetables submerged and not exposed to air (and oxygen), is sterile, and can be thrown away after. I find this is less fiddly than the other methods, and less equipment to sanitise too, plus more effective. 1. Vinegar is not a suitable sanitising liquid, especially if it is unfiltered apple cider vinegar. ACV, as I teach in my workshops, use a live SCOBY (Symbiotic Culture of Bacteria and Yeasts), and the resultant ferment has live cultures. If you use this to clean, you will basically be spreading live yeasts over your equipment and surface that will contaminate your other ferments. 2. 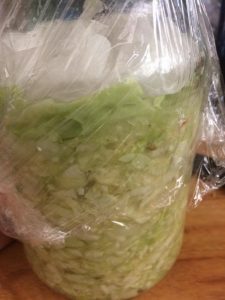 Do not overfill the jar – fermenting cabbages and other vegetables will expand a little, so if you overfill, you risk liquid leaking out over the sides, and compromising sterile conditions. 3. When you are opening up your ferments to taste them to see if they are ready, make sure you sanitise your spoon, and have clean hands too. 4. Keep your different ferments separate. 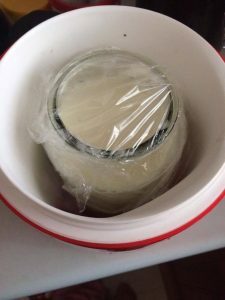 Don’t place your sauerkraut beside your milk kefir or sourdough starter. Kombucha is finicky in my experience, so I keep that separate from all ferments. If you have any further questions about fermentation, feel free to ask. 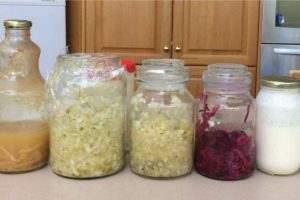 I am always happy to assist where I can, or point you to groups or resources that know better / are more experienced than I. I have been making fermented foods for myself since 2011, but I only know and practice a fraction of all the different types of ferments available from many cultures!